Talk about a long-standing Lowcountry tradition… it’s time again for the 58th annual (!) 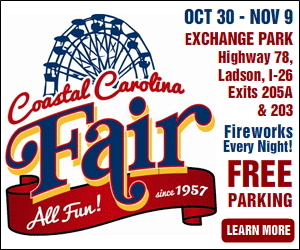 Coastal Carolina Fair. It’s a pretty big deal around these parts, and 250,000 are expected to attend over the course of its run. Who knows – maybe you could have your own “The Notebook” Noah-meets-Allie moment! A dozen big musical acts will be performing, including two artists from season 4 of The Voice. All concerts are at the Lakefront Stage, and admission is free with entrance to the fair. Performers include: Danielle Bradbery, Big SMO, The Swon Brothers, McClain, including China Ann McClain, Hotel California (a Salute to the Eagles), The Willis Clan, Colt Ford, Big Daddy Weave and the Beautiful Offerings Tour, The Embers, Band of Oz, and The Guess Who (Eddie Money performed last night). …and of course the Midway Rides and Kiddieland Rides! There are more than 65 carnival rides this year. Oh, by the way, Happy Halloween! If you’re choosing to spend it in a Charleston beach house, especially one of our Isle of Palms luxury rentals, keep an eye peeled for those little trick-or-treaters – though many of them head to the IOP Rec Center for the island’s Halloween Carnival. So Happy Halloween… stay safe, and may you have more treats than tricks come your way. And when you are looking for rental homes South Carolina – namely beach rentals Charleston – call EP. Our portfolio has the best in luxury beach house rentals SC. POST SCRIPT – Remember to FALL BACK —- set your clocks BACK one hour Saturday night (or rather, 2:00 a.m. Sunday morning), November 2nd. Yay, an extra hour of sleep or beach time!